This innovative, high-performance formula, promotes healthy, natural lashes and brows in just 4-8 weeks. Lashes and brow are nourished and strengthened to fight damaging environmental elements, and premature fallout. Vital proteins, vitamins and moisturising ingredients, join forces to help rejuvenate, and fortify delicate lashes and brows. Powerful polypeptides provide effective protection against breakage, and naturally support stronger, more voluminous lashes. Paraben free and safe for contact lens users. I had been apprehensive about using an eyelash serum since I have really sensitive eyes. However after a bad false lashes experience I braved using RapidLash. My eyes did not react to the serum at all which instantly made me feel better. After applying it daily I soon saw the results. Around week 3 my lashes were longer and fuller. I am regularly getting compliments about my luchious lashes. 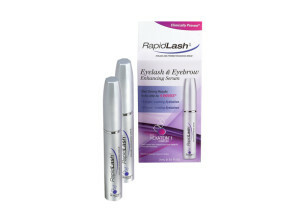 I would fully recommend using RapidLash although it’s price is steep at R999 for 3ml, I am on my second month of using the tube daily and there is still plenty left. It is clinically proven to improve the overall appearance and condition of your eyelashes. It is easy to use, simply run the brush along the base of the eyelashes starting from the corner of the eyes. My only negative comment is the daily application is a hassle and waiting for the results can be a bit annoying. I like instant gratification. Other than that I am really happy with both the product and my results.